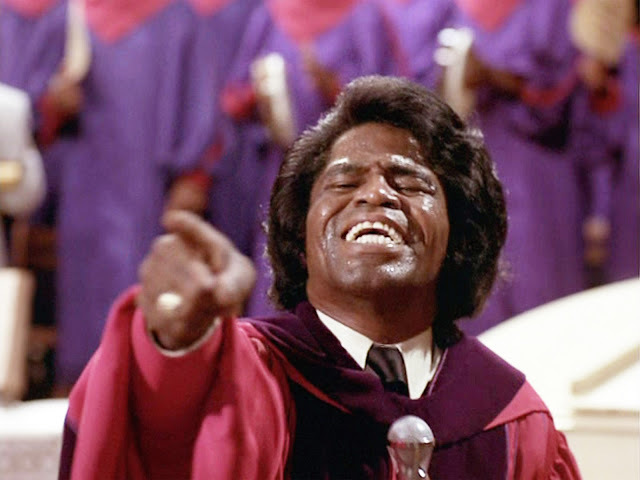 Yes, that's James Brown in the academic robe favored by African-American preachers, and he's calling out the question to John Belushi and Dan Aykroyd as the Blues brothers. It comes in the midst of a stirring rendition by Brown, a church choir, a backup band, and a company acrobatic fan-waving dancers of "The Old Landmark," a gospel standard that inspires the brothers to put their band back together to raise money to save the orphanage in which they were raised. The movie is The Blues Brothers, and it's a shaggy dog of a film stuffed with amazing R&B performances, car chases, celebrity cameos, and occasional blue language. It manages to respectfully poke fun at Catholicism, full gospel Protestantism, neo-Nazism, soul culture, blindness, prison life, government bureaucracy, law enforcement, homelessness, and probably several other politically dangerous topics more successfully than any other Hollywood movie I can think of. See it. Show it to your teenaged children. And there ends the plug. The occasion that led me to search for that photograph, and then to go off on a film nerd tangent, is my last Sunday at Parkrose Community United Church of Christ. For three and a half years, I have been playing for Sunday morning services at Parkrose, accompanying hymns and choral anthems and improvising preludes, offertories, and postludes. I come to each service with an armload of fake books and, drawing inspiration from the theme of the service and the content of the sermon, select Broadway, jazz, and pop standards that will evoke those themes in both poignant and humorous ways. For a postlude, I always jazz up whatever I've chosen to play, whether it's a standard or a hymn, so people can leave the sanctuary dancing. It's been a fun gig. It paid well, I received plenty of appreciation for what I did, and I felt like I contributed to a worthy cause: inclusive Christianity for a diverse community. But it was time to leave. Why was it time? What led me, a month ago, to give notice? Two things: time and progress. The time piece of this transition is easily conveyed. For the first time in four years, I am now teaching full time. Five days a week, I come home exhausted, for while the work is engaging, enjoyable, and rewarding, the intense focus required drains me physically. There's not much left for Amy. I realized within the first two weeks of the job that I needed Sundays back. That word "back" is somewhat paradoxical, because, except for very brief periods in my life, my Sundays have always included church. And that's where the progress piece kicks in. I grew up in church. My father was a Methodist minister, and there was never any question what I would be doing Sunday mornings, even when, as a teenager, I desperately wanted to sleep in. This religious upbringing stuck with me, and all through college, graduate school, and my first year as a teacher, I stayed active in church, singing in choirs, spending large portions of my Sundays (and often my Wednesdays) in a church. Going to seminary just amplified that involvement, which now became professional: throughout seminary I worked as a church choir director, did case studies of church services, and for three years had student pastorates that had me preaching weekly. The only break came my last semester of seminary when, fired from a choir job for dozing off during a sermon, I was free to attend the church of my choice for a few months. It never occurred to me to just stay home, workout, or take my wife and child on a weekend excursion. I belonged in church. Graduating, I went immediately to serving churches full time, continuing to do that until January 2000, when I left ministry to tend to some emotional wounds. Still I attended services, now with the intent of sitting with my children during church. I also began attending the Sunday evening services at Metanoia Peace Community, which was to become my physical, as well as spiritual home, for three years. Soon after moving into the Peace House, I was recruited to play the piano in an African-American congregation. I was there for five years, then took a job as music director at a much larger church in Vancouver. Three years there, and I was again cut loose. For a year and a half, Metanoia was my only church involvement, and my Sunday mornings were free. Then Parkrose recruited me. And here I am again, looking at Sunday mornings without church. But there are two differences from the other intervals like this: I'm here by choice; and I have nowhere to go in the evening. Metanoia disbanded a little over a year ago, and I have not sought out a community to take its place. This blog is about transition, adult development, evolution, whatever else you might want to call it. I began writing it last spring because I sensed myself arriving at a crossroad. "When I was a child, I spoke like a child, I thought like a child, I reasoned like a child; when I became an adult, I put an end to childish ways." (1 Corinthians 13:11) Richard Dawkins quoted this verse on Bill Maher's Real Time Friday night, and it resonated powerfully with me. For Dawkins and Maher, Christianity was part of childhood; once they had matured and inquired into its foundations, they outgrew it. I don't know yet if "outgrowing" is what has happened to me, but I have certainly grown away from the religion of my youth. A large part of that growth came, paradoxically, from my training to be a professional Christian: theology, Biblical criticism, liturgy, church polity, pastoral care, church history, missiology, all these things contributed to me knowing a bit too much about the inner workings of the church for it to continue to be a spiritual home. Metanoia was the last resort for me to stay a Christian, a community that was intentional, prophetic, radically inclusive, and embraced me as no other community has. The memory of Metanoia will always be a home to me, as will many other congregations that nurtured me over the decades. But like the houses I grew up in, they and it are no longer the home in which I live. Even as I participated enthusiastically in the life of Metanoia, I knew something about it was not working for me, and never would. During my first few years at Metanoia there was a member named Phoenix who brought a lovely Buddhist flavor to the community. Over time, she fell away because, as she openly said on many occasions, she just had too much of a problem with the Jesus thing. I don't have problems with Jesus, but I do, very much, with Christ. It took Metanoia for me to realize this: there is to much Christ in Christian. I cannot accept Jesus as Messiah. My informed understanding of the whole Bible, coupled with my respect for Judaism and my rejection of the anti-Judaism implicit in much of the New Testament, mean that I cannot accept Christ as my Lord and Savior. Beyond that, I have grown away from petitionary prayer. It simply does not work, and it implies things about God I cannot believe. And finally, the church is just not a place for me. Parkrose is a wonderful, warm, welcoming community, but I do not belong in an institutional faith community. The worship that works for me takes place outdoors, on trails; in concert halls and arenas, immersing myself in music; and at the keyboards (both piano and computer), creating musical and written art. And my service? It takes place in a gymnasium, making the world a better place for children as I share the liberating force of music with them. I'll be writing more in the coming days about this transition, and how it feels to be fully church-free for the first time in my life. Stay tuned.